Save cut vegetables, skins, etc., in your freezer or refrigerator to make vegetable broth to add to soups, sauces, stews, or stir-fries. Making vegetable broth is easy in a slow cooker! Save leftover vegetable steaming water, marinades, and sauces, for use in soups and salad dressings. When cooking grains, make extra to use in salads, stir-fries and soups. You can also make a big portion of grains and freeze serving size portions of the grains in plastic bags. 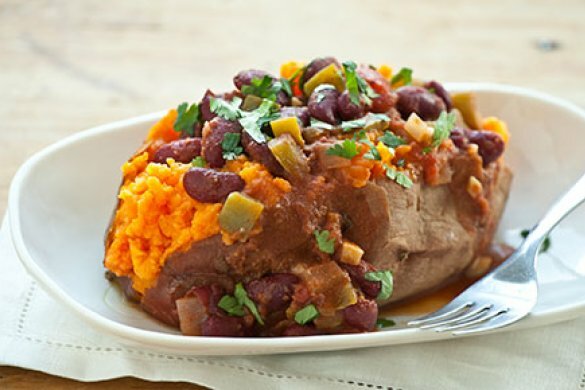 Canned beans save a lot of cooking time, but you should always rinse canned beans to reduce the amount of sodium in them. Freeze extra cooked beans. in freezer in plastic bags. It’s quick and easy to add small portions of frozen beans to soups, sauces, stews, and stir-fries. Pureed cooked beans can be part of an excellent sauce for cooked vegetables and/or pasta, or in a salad dressing. Quick Salad Trick #1: When not using pre-washed salad mixes, wash and spin-dry enough greens and lettuces for at least three days-worth of use. 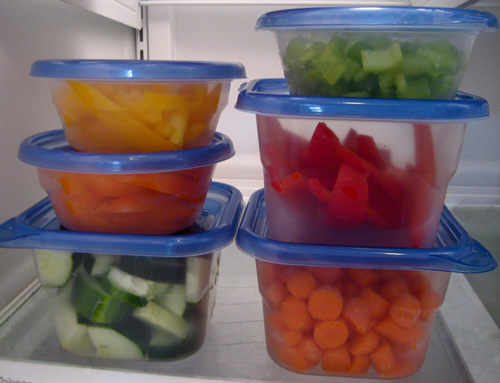 Store the greens in between paper towels in a suitable container or large plastic bag in the fridge. The greens will keep longer by remaining dry. Quick Salad Trick #2: Wash, dry and cut enough raw vegetable toppings (summer squash, radishes, celery, grated or sliced carrots, diced green onion, etc.) for three or four salads in advance; store each ingredient separately in sealable containers. 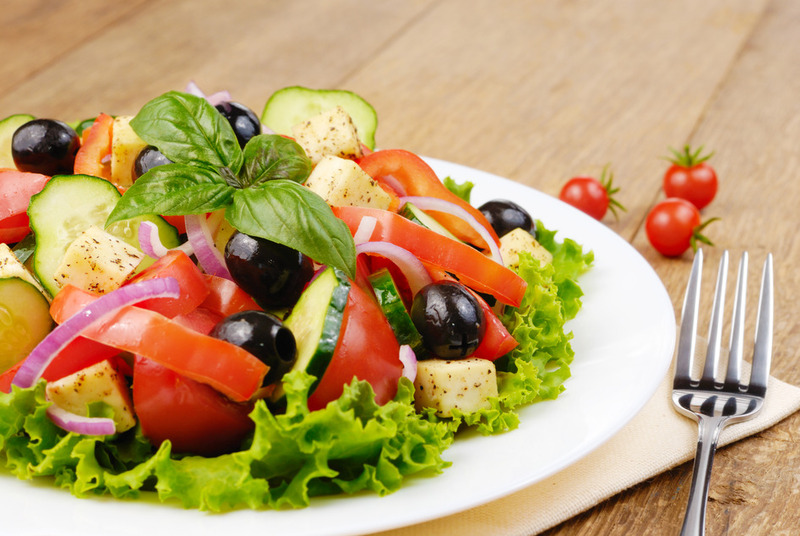 By preparing ingredients all at once in advance, a salad can be assembled in a few minutes. Quick Salad Trick #3: Make your own oil-free dressing in a “spent” mustard bottle or other nearly-empty condiment container. Cut desired vegetables into like-sized “chunks” based upon their density (example: cut carrots a little smaller than zucchini). Line a ceramic casserole dish or a non-stick cooking sheet with non-stick foil (one side is aluminum, the other is non-stick). 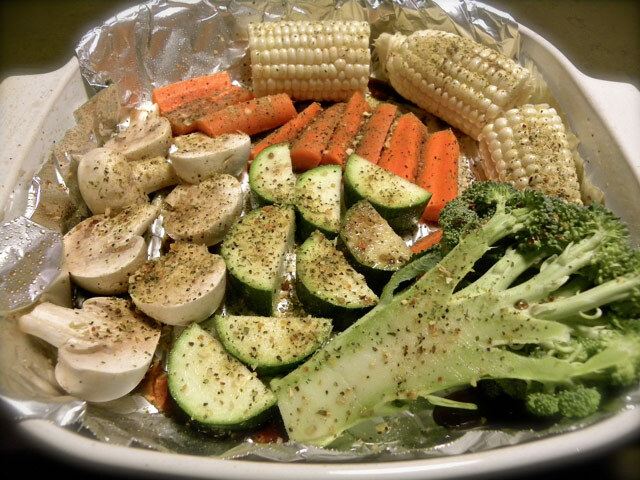 With foil layered over parchment paper your dish can handle higher temperatures than parchment paper alone; and foil can be molded to fit the dish or sheet (and also re-used). Preheat oven to 400°F – 450°F. Spritz vegetables with a marinade of choice (balsamic vinegar, a smidgen of tamari, and water is a good combination). Dust spritzed vegetables with garlic powder or a favorite “multi-spice no salt” mixture (Mrs. Dash has several varieties and Trader Joe’s 21-Spices is superb). The spices will adhere nicely to the spritzed vegetables. Cook for 30 to 40 minutes until they are brown and nicely caramelized. Add the roasted vegetables to pasta with your favorite sauce, serve over rice, or use in salad. 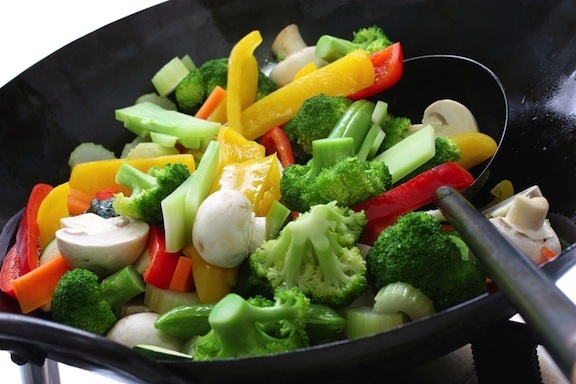 Vegetable Cooking Tip #2: Stir fry vegetables in broth (rather than oil), layering vegetables according to density. Vegetable broth, soy sauce, vinegar, water and other liquids can be used separately or in combination to replace oil. Choose the grain(s) you want to pair with your stir-fry. If cooking brown rice, barley, or other grains that take more than 20 minutes, start that process first. If cooking fast grains such as quinoa or millet, you can make your stir-fry first. Heat onions, garlic, and red pepper flakes in vegetable broth or other oil-free liquid. Add the more dense vegetables first, then gradually add the less-dense layers. Top it off with chopped greens. Once the greens start to wilt, stir the ingredients until cooked to desired texture. Add a half-cup or more of liquid (chicken broth and soy sauce or Bragg’s Liquid Aminos) mixed well with 1 or 2 tablespoons of cornstarch or arrowroot powder; stir the fry a few times; simmer a few minutes, turn off heat, and let steam a few minutes. Be creative! Broiled sliced polenta or a baked potato are uncommon but taste wonderful when topped with a stir-fry. Another tip: Layer sliced mushrooms above other vegetables so their juices will drip down to cook the other vegetables. Vegetable Cooking Tip #3: Steam them while you’re prepping the other courses of your meal. 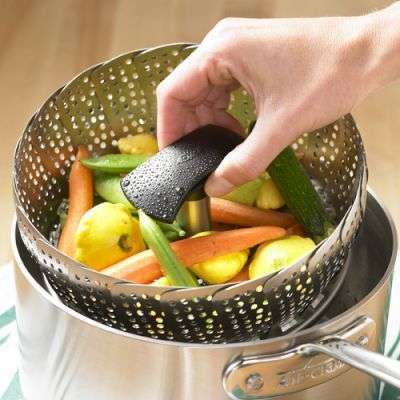 As mentioned above, the quick trick to this is to have your veggies pre-cut and ready to add to your steamer basket. 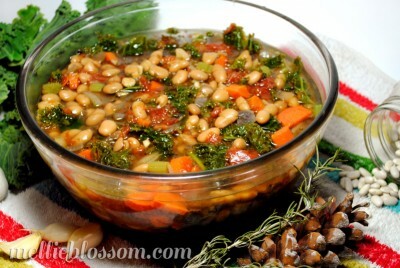 In this layering technique, the liquid flows DOWN through the spices, heats and flavors the beans, and reduces the kale. After about 3 hours on HIGH or 6 hours on LOW, stir a few times. Add the remaining cup of chopped kale and 2 tablespoons or more of tomato paste, depending upon how crazy you went with the chopped peppers! You can use tomato paste or cornmeal to thicken sauces, stews, and soups. Stir and cook another two hours until done to taste.